Don’t be offended. I’m simply asking a question based on my observations that are not limited to the iMore Forums. If I opt to buy an iPhone encased in glass, why would I blame Apple when I drop and break it? It’s not like Apple dropped it. Is not the fault all ‘mine’? Why would I blame Apple for choosing to keep a device that I felt was too slippery to grasp firmly and then end up dropping and breaking it? Did I not have the option to return the slippery device or encase it in a non-slippery case? When do we take responsibility for our own actions or decisions? Apple creates new iPhone devices every year, and during the keynote, they describe the materials used to make them. Afterwards, we make the decision to buy those items, and yet, rush to blame Apple for them not being strong enough, foolproof enough or not made specifically to our personal preferences. In addition, why do we get offended when someone uses ‘common sense’ by reminding us that there are non-Apple options available that may suit our needs better? I mean, when we complain, we tend to mention non-Apple devices that have everything we desire, but how dare someone uses common sense and recommend those products to us? I mean, it only makes sense these days to continue to use and complain about a product you’re unhappy with, right?.... ....is common sense and personal responsibility no longer highly revered? PLYHollywood, btru82, syc79 and 15 others like this. Just_Me_D, nr2d, MB64 and 2 others like this. Apple never made the claim that the glass construction was unbreakable. Glass is glass. It's breakable. If you don't use a decent protective case, it's on you if you drop and break it. I don't have the X, but if I did, it would be protected in an Otterbox or other protective case. And those minimal "look good" cases would not suffice. Common sense departed with the onset of so called "zero tolerance". I suppose folks have zero tolerance for something breaking when they drop it. Just_Me_D, MB64, nikkisharif and 1 others like this. When Apple says, "This is the strongest glass ever used in an iPhone", what are they advertising and what is the point in referencing that? I agree with you though. If I drop my phone...I dropped it. That's my fault. I chose to purchase insurance and wear a case just to protect myself from these events. My only point in that question is simply asking why Apple would feel compelled to mention such a thing. Glass breaks. All glass. So why does Apple feel the need to tell us the glass in the iPhone X is the strongest glass ever put in an iPhone. What does that do for us? And what should the average consumer assume from that statement? They are saying that to create some awe effect with people, but the reference in itself is only limited to the iPhones 4 and 4s, as those where the only iPhones with glass backplate. In doing so, they don’t face any legal action from anybody who may or may not prove that other manufacturers have stronger glasses out there on their devices. BreakingKayfabe and olliegrl like this. What legal action could take place from them not making any claims of durability at all? Simply don't mention it. Why would anyone not use a case with this? 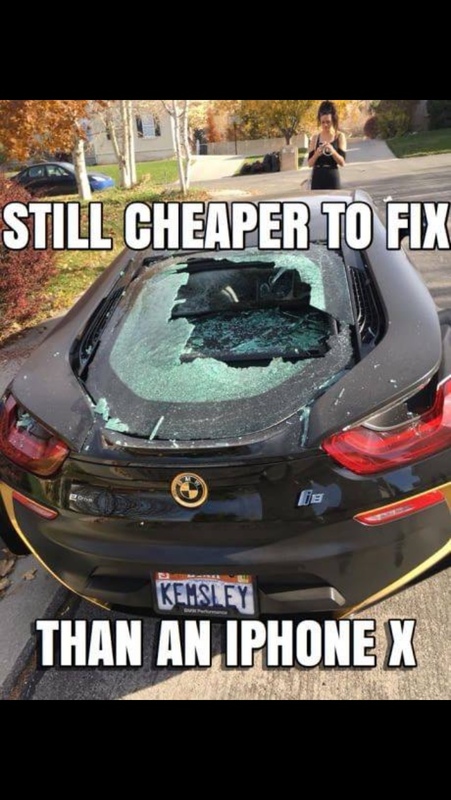 They are saying that it’s the strongest glass ever put in an iPhone. It’s as meaningful as saying the new iPhone is the best iPhone ever made. Of course it is. They did not say the glass was unbreakable. That’s because kids are not taught being responsible for their actions, they are taught about entitlement and being dependent on the government or someone else except themselves. It’s called indoctrination, sad but very true. Glad I am retiring in January and will be out of the workforce. Tartarus, nr2d, Mr.Willie and 2 others like this. You mean like when someone can sue because the hot coffee is...well, hot? Tartarus, nr2d, Buckeye2009 and 3 others like this. Because some of us don't like cases on our phones. If I drop it, I drop it. Tartarus, PLYHollywood, itsnotmeitsyou and 2 others like this. If I opt to buy an iPhone encased in glass, why would I blame Apple when I drop and break it? Simple. Because people are very stupid. Tartarus and dannejanne like this. Plastic phones don’t usually break when dropped. When phones cost $999 and they get dropped (because humans are clumsy), it is absolutely a manufacturer’s fault for creating a product that can break when dropped. For example, Samsung created a device more durable than its S8, called the S8 active. The S8 active has reinforced edges, a flat, shatterproof display, and it’s made of durable materials. The device can withstand falls from a meter (3 feet). I don’t understand why every phone isn’t made that way. So yes, if I dropped my X and it shattered, I’d be pissed at Apple too considering I paid $1250 out of pocket for my device. But it’s in an Otterbox Defender. Of course not. I'm just questioning the why. Why would a company tout the materials being used as "the best/strongest ever". My first inclination is to assume it's for durability points. Customer: These iPhones have pretty durable glass right? So I don't need a case? Me: *Facepalm* The phone is still glass on the front and glass on the back. I would highly recommend you protect it. It's not cheap if something happens. If the company isn't Motorola and we aren't discussing the Z2 Force...I don't want to hear any company tell me how durable their materials are. Unless their intention is to say how durable their phone is. You’re reading my post wrong. They don’t mention other manufacturers, for legal reasons. Yes, leaving the durability claims out altogether is also an option, but where is the fun in that. That is a true statement. They didn’t say that it was the strongest glass ever. They said it was the strongest glass ever used in an iPhone! In addition, Apple did not say that it was unbreakable! I agree with you though. If I drop my phone...I dropped it. That's my fault. Now that’s being an adult, sir. I chose to purchase insurance and wear a case just to protect myself from these events. My only point in that question is simply asking why Apple would feel compelled to mention such a thing. Glass breaks. All glass. So why does Apple feel the need to tell us the glass in the iPhone X is the strongest glass ever put in an iPhone. What does that do for us? And what should the average consumer assume from that statement? Being that people were complaining how other devices were using gorilla glass, etcetera, Apple felt the need to state an improvement in the glass they were using. That’s all. Because I don’t want to? Because I don’t have to? If I drop and break it, I have AppleCare. As far as indoctrination into “depending on the government” - I live in a socialist country with a healthy safety net and universal health care - thank goodness (my mom had a triple bypass today and we won’t see a bill for so much as a bandaid and don’t have to worry about bankruptcy because of our reliance on the government and I wouldn’t have it any other way)- but if I drop my phone, that’s on me. Not sure what that has to do with anything or why it was mentioned at all. If that’s the argument, I can say the blame may be more on the overly litigious nature of the US culture and the nature to sue if someone gets a paper cut. I’d say that is far more dangerous than trying to fear monger about government dependence. Tartarus and BreakingKayfabe like this. Normally, I would keep a response to post like this to myself...because it was plainly written by someone younger than myself because it has the notion of "entitlement" written all over it. But, because of the two positions you hold here on this web forum...that deals primarily with fairly expensive mobile devices instead of plastic "go phones", I felt an urge to do so. Apple is in the business of building high-end mobile devices that are borderline objects of art. People have been more than willing (as you too were, obviously...) to spend the price to buy mobile phones that were not cheaply made and ugly...but rather were crafted of metal and glass, and beautiful. You did know that the phone was made of glass panels before you bought it, didn't you? I mean, you certainly did enough due diligence to know that it was not made of unbreakable glass? That means if you dropped it...it would most certainly break. Glass does that. All glass does that. Every time. Apple offers insurance against damage...even from negligence or clumsiness, and offers it at a very reasonable price. Most service carriers do the same. My personal carrier is Verizon...and for $11.00 monthly I am completely covered come what may. I always use an Apple leather case on my phones, and rarely if ever drop them...but if I do and it breaks, I have the insurance on it just like I have on my car, that I hardly ever wreck. It just makes good sense to CYA. ...you are pissed at Apple? I ask again...are you serious? flyinion, Ledsteplin, Just_Me_D and 3 others like this. OK, just asking. I suppose I could have asked the question better to avoid the head getting bitten off. People are always quick to blame someone or something instead of owning their mistakes or misfortune. People need to own when they drop their phone and it breaks because they decided not to put a case on it. Common sense dictates protecting a $1000 device. Would you treat your car or home as if it were disposable. NO! Just_Me_D and Jude526 like this. I agree with you on that. They did say strongest ever put on an iPhone. That’s the keyword right there “on an iPhone”. They were not comparing themselves with other phones. You realize her lawsuit was not because the coffee was merely hot, it was around 200 degrees hot, as hot as radiator fluid in your car after driving. This lawsuit is ridiculed, but she suffered horrific burns over 16% of her body and was hospitalized for 8 days. Mr.Willie and anon(5630457) like this. That poor old lady gets used as a punchline - and no one knows McDonalds knowingly served coffee that was dangerously over the temperature threshold. She gets laughed at after having multiple skin grafts because McDonalds was serving essentially napalm in a cup. Mcdonalds PR team did a great job making sure that’s what people think. anon(5630457) and jj2339 like this.